There are a large number of metals and metal alloys used in fine and artisan jewelry. Here I discuss many of them, and their strengths and weaknesses. Platinum: Platinum is a lovely metal! It is very unlikely to cause an allergic response, and its gray color looks lovely with both diamonds and colored stones. Unfortunately, I do not have the facilities to work with it. Gold and silver- the metals I mostly use- contaminate it, and it requires far hotter temperatures to work than I can achieve. I can use the occasional piece of platinum as an accent on a largely gold piece- but I do not work in Pt itself. Gold: Well, that covers a lot of ground! There are a huge number of gold alloys available now, with all sorts of qualities. I'll discuss here the ones I'm most familiar with. 22k+: This is the real thing- high-karat gold. 22k is 91.7% gold (24k is pure gold). These golds have a rich, luxurious golden color... but tend to be soft, so they do not hold up well to heavy use. Often people try to create sturdier alloys that have some of the rich color of the high-karat ones, but make the jewelry sturdy enough to wear. 22-24k golds certainly have their place in a jeweler's work, but we do have to keep in mind their weaknesses. 18k: This is the most favored "artisan" gold, partly because the 25% of other metals make it sturdy enough to wear, and partly because they also give one a range of colors to work with. The colors range from a very pink or red one with lots of copper, to a "green" with a lot of silver. My personal favorite 18k yellow gold is an alloy from Hoover and Strong called "royal" yellow; it has a richer, buttery color than most yellow alloys. 14k: This alloy is generally preferred for rings that will be worn daily. Because it has almost 42% of other metals (which are often not specified), it's sturdier than higher-karat alloys, and holds up well to hard use. Wedding rings are commonly made from 14k. Again, many colors are possible, and my favorite 14k yellow alloy is H&S's "royal" yellow. White gold: I've pulled this out specifically, because so many people are interested in it. Basically: gold is yellow. "White" golds try to diminish this yellowness by mixing the gold with other things. Nickel white gold: The most common white gold is in the USA is mixed with a large amount of nickel. This makes a nicely white gold alloy... but has several undesirable qualities from my point of view. The first is that nickel is probably the metal to which people are most likely to develop allergies. I am very reluctant to make a piece of jewelry to which someone may become allergic! It is also very brittle, which makes it hard to use with stones, and in my opinion, it's less capable of holding up to hard wear. I prefer not to use nickel white gold in my work. I have found one 14k nickel white gold alloy with both decent color and decent working properties for my work: the X-1 alloy from Stuller. While the color is similar to that of rhodium plating, and its working properties allow me to use it for some of my rings- it still does contain an appreciable amount of nickel, and thus can cause allergies. In addition, Stuller does not guarnatee that its metals are created only from recycled metal. Still, if you have your heart set on a lighter white gold, this is an option for designs that do not include stones. Palladium white gold: An alternative to nickel white is palladium white gold. Palladium is a metal in the platinum family, and can be mixed with gold to whiten its color. The result is a grayer white gold than the nickel white makes- but it's not as likely to cause allergies, and has excellent working qualities, particularly for setting stones. This is my favored white gold. There are other "white" metal options, however! Palladium: This is a platinum-family metal that's 95.2% palladium. As I write this it's about half the price of gold, so it can be an effective alternative. It looks very similar to palladium white gold, although if you put the 2 next to each other, the gold is a slightly warmer color. It makes a great choice for a Mobius ring- and for other pieces that lack very elaborate fabrication. It is slightly softer than 14k palladium white gold, and if you put it right next to the gold alloy, the gold has a slightly creamier look; however, if they're not right next to each other I think anyone would find it hard to tell which it is. It wears very well; I have a ring made of Pd that I wear much of the time, and even though I am hard on my rings, it's holding up beautifully. 2. Argentium sterling silver, hardened (92.5% silver, the rest copper and germanium). 3. Sterling Silver (92.5% silver, the rest copper). 4. Sterling silver/Palladium: 92.5% silver, 3% palladium; the rest copper. 5. 14k white gold, nickel-bearing (Stuller's X-1 alloy). 6. 14k Palladium white gold, with no nickel. 7. Palladium (95.2% alloy, no nickel). These are in position from (roughly) lightest/left to darkest/right. The finish is brushed to best show the differences in color. Silver: Although silver is less dense and more susceptible to wear than most gold alloys, it has a lovely white color and can be a very practical choice for many things. Since it is both cheaper per ounce, AND less dense than gold or the platinum family metals, it can be very cost-effective for a design- especially one that will not see a lot of wear, or which is substantial enough to withstand wear. I love silver, and do a lot of work with it. There are various kinds of silver in common use. Fine Silver: this is pure- 99.9%- silver. It has a lovely white color and is somewhat less prone to tarnish than sterling is. It does have drawbacks, though- it's very soft compared to sterling, which means it dents, wears out, and otherwise does not withstand hard wear particularly well. This is especially relevant with all the work that's being done with PMC and Art Clay- while these are amazing products and allow wonderful work to be done- that work is even less sturdy than fabricated pieces made of fine silver mill products, since the firing process leads to porosity in the PMC/Art Clay (think of it as a metal foam, and you won't be far off). Keep this in mind if you look at rings, in particular, made of PMC/Art Clay fine silver. Most traditional metalsmiths may use fine silver for a bezel on a delicate stone, but not to fabricate an entire ring or bracelet. Sterling silver: This is legally 92.5% silver, and the rest can be anything. As I tell people, it could be broccoli if one could figure out a way to make the mix stable! In good-quality sterling, the rest is copper, and that makes a pretty but sturdy, white metal that's useful for many things. It does tarnish due to the copper. Argentium sterling silver: This is a legal sterling (92.5% silver) that replaces some of the copper with germanium. Besides the benefits to its working qualities that I love, it has 2 significant benefits for jewelry. First, it is very slow to tarnish. Second, it can be hardened to make it as hard as 14k palladium white gold, which can make it a reasonable choice for fairly simple and heavy rings that will get a lot of wear. In general, I prefer to make silver rings out of Argentium, since I know they hold up better than regular sterling or fine silver. Sterling/Palladium: This alloy from Hoover & Strong replaces 3% of the copper in regular sterling with palldium. This gives it a slightly darker gray yet less-yellow color than the alloys that include gold or more copper, and adds some density to the metal. It is both somewhat softer than hardened Argentium, but also somewhat denser- in my informal tests, these wear similarly. Reactivity: Some metals are more reactive than others, and if you think you may have skin chemistry or allergy issues, it's well to keep this in mind when making a choice. In general, nickel is the metal to which most people are allergic; this is one reason why I'm reluctant to use nickel-containing alloys, especially for engagement and wedding rings. In general, both pure gold and platinum-family metals (like palladium) are non-allergenic, so alloys that use these tend to be safe- although some people may be allergic to these as well. Alloys that contain silver and/or copper are more reactive than alloys that don't, and while most people can wear them with no issues, occasionally skin chemistry can cause discoloration on the ring and/or on the finger. This is aggravated if the wearer uses chemicals without wearing gloves while wearing the ring. Often getting the ring or its inner side plated with rhodium will help with allergies and reactivity. Rhodium is very non-reactive, and can provide a shield between the finger and the ring. I do not offer rhodium plating myself, and encourage those interested to discuss it, and the issues that are causing problems, with local jewelers. Rhodium plating does wear off eventually, usually in one or more years, so will need to be renewed occasionally. I am happy to discuss these issues with you as we work out the details of your commission; however, I cannot guarantee that your choice will have no problems with your allergies or skin chemistry. Durability: Simply put, the two factors that make metals wear well are hardness and density. Argentium sterling silver, hardened, is as hard as many types of gold and harder than palladium; still, it is not nearly as dense, and so will not wear quite as well. My Mobius rings, and many others, are made with durability in mind (whatever the metal used); still, if this is an important issue for you, I hope you will bring it up so we can together make an informed choice you'll be happy with. Ring sizing is both very precise and very difficult to do. For one thing, everyone's fingers change sizes over the course of a day, of a year, depending on what they've been eating, and (for women) over the course of a month.The range can be up to a size and a half US, and that's a substantial variation! Add to that the fact that there are really no universally accpeted standards in terms of sizing; several different methods of determining size (which vary within themselves); and no easy way of compensating for any of this and... well, sometimes it astonishes me that anyone can ever get a ring made that fits well! Even with data from my set of sizers, I can't guarnatee a precise fit unless I have measured your finger in person; I do, however, have an excellent track record in creating rings that fit well. 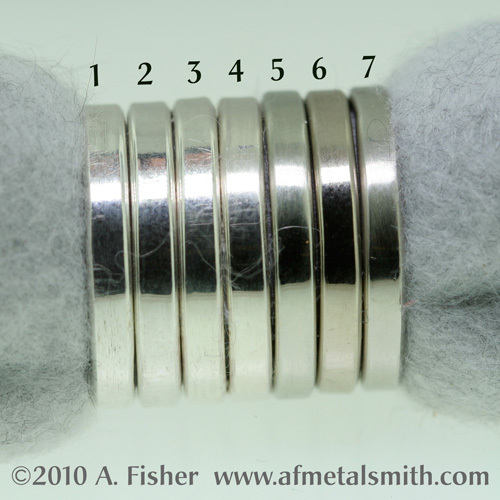 I use some techiques in their construction to help my rings work with the normal size variations fingers undergo. I live in the USA, and am most comfortable working with US ring sizes or with metric data (circumference or diameter measurements precise to at least 0.1mm). If you have British or Eurpoean ring size data, I will ask you to translate that to either US sizes or to metric information, and will make your ring(s) based on that. Considering that I have not found any consistent ways to translate European or British ring sizes to data I trust, I can promise that I will make a ring that meets your specifications- but cannot promise that it will fit properly, since the data seems all over the map. I really recommend borrowing a set of ring sizers! Important: if you are in doubt about the size, it is always best to choose a size that is slightly small. Any local jeweler can easily stretch a ring, up to a half or a full size (depending on the metal). It is much, much harder to reduce the size of a ring- that requires removing a piece of metal and re-joining the ends, and many stones cannot tolerate the heat that this requires. So if you are unsure about the size- go small! I do guarantee that I will make the ring to your specifications. I cannot guarantee that it will fit you, always and comfortably. Please keep the above information in mind when determining your size. I repeat- ring sizing is tricky! For commissioned work, please visit my page devoted to commissioning, or email me with your questions. In general: commissioned work is not returnable. For other work: I will accept returns within 30 days of purchase and in new and unworn condition. Please contact me via email about your situation (including an explanation of the reason you want to return it), and to get an authorization. I cannot offer refunds for any pieces that are returned without authorization. There may be a restocking fee of 15%, and shipping charges are not refundable; if the item is not new and unworn condition, additional fees may be applied. Please contact me if you are interested in this, so we can work out the best approach for us both. If we agree on a return, you will need to send the UNWORN piece back to me in the original packaging, all of which are in new condition; I cannot accept returns of used pieces. Please send it back insured and with tracking and signature confirmation of delivery; I am not responsible for anything that gets lost in the mail. The shipping fees will not be refunded for returns, and such returns may be subject to a restocking fee of 15%, or whatever is necessary to return them to sale-able condition. I do good work, and no piece leaves my studio without being checked multiple times for sturdiness and appropriateness for normal wear. Some individual pieces have vulnerabilities, and I will discuss these on their pages, or in email if you prefer. If you have a problem, I will work with you to resolve it. However, fine jewelry will not necessarily hold up to extraordinary wear or abuse, and while I will repair such if it happens, it will require a fee. I work hard to make my pieces wearable and durable. If I err there, I am happy to work with you to come to a satisfying result. However, I cannot guarantee my work against extraordinary wear and tear, nor against the results of normal wear (like small scratches on a ring worn daily). If one of my pieces has a problem, please let me know email, and we will work together to resolve it. I hope my feedback score on Etsy is reassuring here! It is very important to me to make excellent and durable jewelry, and to be responsive to my customers' needs.